A heterozygous individual is a diploid organism with two alleles, each of a different type. Individuals with alleles of the same type are known as homozygous individuals. An allele is a variation of a gene that affects the functionality of the protein produced by the gene. There can be many alleles in a population, but a heterozygous individual can only have two of them because every diploid organism receives one allele from each parent. Although each organism can have only two alleles, there can be many, many variations of a gene present in a population. Heterozygous is a description of the genotype, or combination of alleles present in an organism. The genotype gives rise to the phenotype. Depending on the different relationships between alleles, different phenotypes are created in a heterozygous individual. In alleles that show complete dominance, the heterozygous phenotype will be the same as the dominant phenotype. Incomplete dominance, in contrast, produces a heterozygous phenotype that is somewhere between the dominant and recessive phenotypes. A third type of relationship, codominance, exists when the different alleles are expressed individually, in different parts of the body. In a codominant trait, the heterozygous individuals will show the phenotype of one allele on some parts of their body, and the phenotype for the other allele in different parts of the body. Sickle-cell anemia is a recessive disease that causes the blood cells to form incorrectly. Instead of a broad, round disk, the cells form in the shape of a crescent moon, or sickle. The cells do not function correctly in this shape. Anemia, or the condition of blood not carrying enough oxygen, is a severe condition in people with two recessive sickle cell traits. The condition can also cause strokes, pain, and clotting in the blood stream. However heterozygous individuals with the sickle cell trait do not suffer these ailments. The one normal allele they have produces enough red blood cells to keep them healthy. 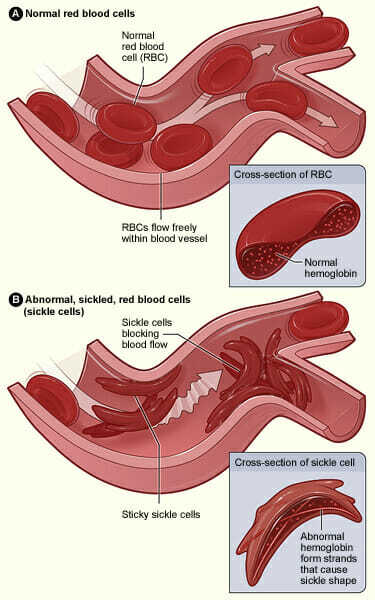 Below is a picture of normal cells versus sickle cells in the bloodstream. While it may seem like heterozygous individuals are still at a great disadvantage, there is actually a cool benefit of the sickle cell trait. Individuals with only one sickle-cell allele still produce quite a few sickle-cells, just not enough to make them sick. However, when the malaria parasite infests the body, it attacks and resides in blood cells. It is thought that the sickle cells collapse around the parasite, and make it easier for the body to filter the parasite from the blood. More heterozygous individuals are able to survive malaria in this way. Scientists think that is why the sickle-cell allele has a fairly high frequency, especially in the tropics where malaria cases are high. Interestingly, how curly your hair is can be linked to genetics. The gene the decided the phenotype for hair curl produces a protein that makes hair strands grow curvy. An individual with two recessive alleles, or two non-function alleles, will have straight hair because there is no protein that causes the phenotype of curliness. Homozygous individuals with two curly alleles will have very curly hair. Heterozygous individuals have a phenotype somewhere in the middle, what people might call “wavy” hair. In a heterozygous individual, only one curly allele is present, and only half the amount of protein can be made. This causes the hair to be about as half as curly as in a homozygous curly individual. This is a pattern of incomplete dominance. If you have ever given blood to a medical blood bank, you are aware that blood comes in different types. The types of blood correspond to proteins on the surface of blood cells that are recognizable by immune cells in the human body. Put the wrong type of blood in the wrong person, and they could die from the immune reaction. There are several different alleles in the population that have different relationships with each other. The different alleles are A, O, and B. They produce the different genotypes shown in the Punnett square below. A and B are dominant over O, but codominant with each other. AA and AO are known as the “A” blood type, because only “A” proteins are present. BB and BO are known as the “B” blood type, because only “B” proteins are present. OO individuals produce no proteins on their blood cells, and can donate blood to anyone. In AB heterozygous individuals, some cells express “A” proteins, and some express “B” proteins. 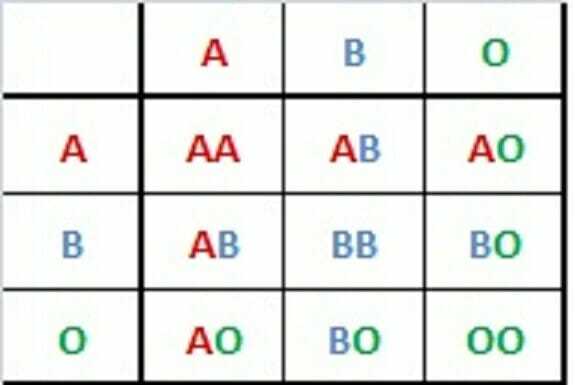 This means you can give an AB heterozygous individual either “A”, “B”, or “O” blood type, and their body will not reject the donation. This makes heterozygous individual the easiest to give blood to. OO homozygous individuals might be able to donate to anyone, but they cannot receive blood from anyone but another OO donor. Just another advantage of being heterozygous. Genotype – The combination of alleles that gives rise to a phenotype, or physical trait. Diploid – Cells that contain two copies of each gene, but can have different variants, or alleles of each gene. Incomplete Dominance – When two dominant alleles produce a third, intermediate phenotype in the heterozygous individual. Codominance – When two dominant alleles are expressed at the same time, but in different parts of an organism. 1. An individual has the genotype AA for their blood type. The same person has wavy hair. Though they don’t display the traits of sickle cell anemia, they do have some sickle cells in their blood. Is the person heterozygous or homozygous? C is correct. The individual in the question has genotypes that are heterozygous, and traits that are homozygous. The terms heterozygous and homozygous can only describe one genotype, or phenotype. Sometimes an organism will be described as a “heterozygous individual” but this term only applies to the one genotype that is being discussed. Any number of traits can be heterozygous or homozygous in an organism, it all depends on the genetics of the parents and possible mutations. 2. Gregor Mendel, a friar who studied peas and founded modern genetics, was at first amazed when he would take two plants showing dominant traits, cross them, and the offspring would come out at a pretty close ratio of 3 plants with dominant traits to 1 plant with recessive traits. What were the genotypes of the parents? B is correct. To get offspring in a ratio of 3:1 with traits that show complete dominance, the parents must be heterozygous. If the parents were homozygous dominant, they would produce only dominant offspring. If the parents were homozygous recessive, they would have recessive traits instead of dominant ones, and would produce offspring with only recessive traits. 3. Scientist use two techniques in unison to analyze DNA. The DNA is cut up with special enzymes and a polymerase chain reaction, or PCR, is used to multiply the DNA molecules. Then, the DNA is put through a gel electrophoresis machine that sorts the DNA molecules by size. If a homozygous dominant genotype produces only large molecules, and a homozygous recessive genotype produces only small molecules, what will a heterozygous genotype of these two alleles produce when put through the procedures? A is correct. A heterozygous individual has two alleles. When cut up by the enzymes before being multiplied by PCR, a heterozygous genome would produce some large molecules, from the dominant allele, and some small molecules, from the recessive allele. On the electrophoresis gel that sorts the molecules by size you would see two bands, one of large molecules and one of small molecules. The genotype would not produce medium sized molecules because it does not average the alleles, it simply contains both.